Our River Seine cruise is designed for families - a fun family river cruise that's all about everything français, from an action-packed two-night stay in Paris to five amazing nights aboard a newly redesigned Tauck riverboat exploring Monet's gardens, D-Day Beaches, Rouen, and Versailles! You'll begin in Paris, where you'll enjoy a guided bicycle ride along the Seine, a Parisian picnic at the Eiffel Tower, and an art-filled scavenger hunt and guided tour in the Musée du Louvre. Explore artist Claude Monet's Giverny where you'll visit inside Monet's house and experience the painted gardens at Giverny. In Les Andelys, take a hike up to Château Gaillard of Richard the Lionheart fame or a walk in a village steeped in history and country charm. All generations of your family will share poignant memories exploring the beaches of Normandy, touring the American Cemetery and visiting the D-Day Academy where a hands-on visit provides your family with a unique look at the year 1944 and the history of the 1944 Invasion - don wireless radio headsets in a Willys jeep or Dodge Command car; receive a map briefing; see Allied and German vehicles, weapons and radios... In Rouen, sightseeing includes historic sites immortalized by Joan of Arc, Notre Dame Square and a 3-D tour of the city's Roman period. At Château de Versailles your family goes inside Louis XIV's gilded palace to see how the royals lived, or they take a bicycle tour of the gardens and Marie Antoinette's farm. All this and more aboard ms Sapphire, custom-designed to the highest standards of quality and comfort for a memorable family river cruise as you wind your way along the River Seine with no more than 98 Tauck guests! Tour begins: 4:00 PM, ms Swiss Sapphire. A transfer is included from Charles de Gaulle International Airport, and Gare du Nord and Gare du Lyon train stations to the ship. Tonight you'll meet your Tauck Director and your fellow family river cruisers at a welcome reception and dinner. The historic city of Paris is at your feet today, literally! Two sightseeing choices today - get an overview of its famous landmark sites on a guided walking tour, viewing the Arc de Triomphe and gargoyled Cathédrale Notre Dame de Paris (no inside visits on this walking tour). Or, if you wish, pedal along the Seine on a guided bicycle ride, passing by the Musée d'Orsay, the Tuileries Garden and the towering Eiffel Tower. Everybody meets up for a visit to the Eiffel Tower and lunch. The rest of the day is free for you and your family to experience "Paree" as you please. Until King Louis XIV moved his household outside of Paris to the Château de Versailles in the 1700s, Musée du Louvre was a royal palace. But now it's an amazing treasure-filled museum - one of the largest and most-visited art museums in the world - and the perfect place for today's guided visit and a fun scavenger hunt. Follow clues to works of art renowned the world over, including Leonardo da Vinci's enigmatic Mona Lisa, whose mysterious smile has captivated imaginations for centuries. Following your morning at Musée du Louvre you'll enjoy some free time in Paris, then embark ms Sapphire mid-afternoon and begin your cruise along the River Seine. Traveling in France is a feast for the senses. In Paris you've already seen - and "hunted" for - some of the most famous art in the world at the Musée du Louvre. Today you'll hear a lot about the artist Claude Monet when you visit his pink house and painted gardens in Giverny. Dock in Les Andelys this afternoon for a choice of sightseeing - hike up to Château Gaillard and listen to stories about Richard the Lionheart, King of England, who built the fortified castle; or take a guided walking tour of the village of Les Andelys. 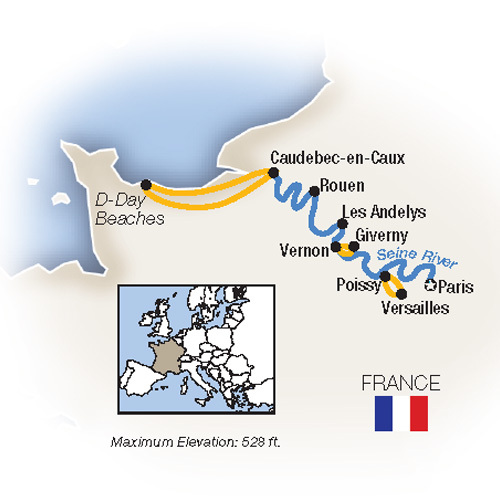 Dinner is back onboard your riverboat as we head for Caudebec for a full day at Normandy's historic D-Day beaches. You'll feel history all around you today as you learn about the heroes of Normandy's Allied Invasion of June 6, 1944 during up close exploration of D-Day beaches. Visit D-Day sites including Pont du Hoc and Omaha Beach plus a poignant stop at the hallowed American Cemetery. Following lunch, the afternoon is spent exploring one of Europe's most unique museums, the D-Day Academy; here you'll have a hands-on opportunity to learn first-hand about World War II. You'll actually touch World War II artifacts, from weapons to wireless radios; put on a workable wireless headset as you climb aboard a Willys jeep or Dodge Command car for a ride between the apple trees; and sample rations that the troops ate while serving here. Drive to Caudebec late afternoon and return to the riverboat to set sail for Rouen. Wake up in Rouen, the "museum city of a hundred spires," this morning and walk off your riverboat right into the heart of history. A UNESCO World Heritage Site, Rouen grew up along the Seine and was an important city for the Romans, Vikings and Normans as far back as the 3rd century! It became the capital of Normandy in the 10th century and many buildings remain from its heyday in the Middle Ages. William the Conqueror used to hold court here. Richard the Lionheart left his heart here and Joan of Arc was burned at the stake here. Explore the sites today on a guided tour that takes you to Rouen's Notre Dame Cathedral - painted by Claude Monet more than 30 times - Joan of Arc Square and the church where she died - you'll also embark on a photo scavenger hunt. After lunch onboard the riverboat, you have an opportunity if you wish to visit Panorama XXL to see a multi-media exhibit about Rouen's rich history. Travel today to Louis XIV's ornate palace, the Château de Versailles, where you'll have a choice of a guided visit inside the palace or a guided bicycle ride. If you choose the palace visit, be sure to take a walk in the garden - it is just as impressive as the palace, covering 1,976 acres with some 200,000 trees, 50 fountains and 210,000+ flowers. And if you choose to explore by bicycle, you'll also visit Marie Antoinette's farm, created in the style of a miniature Norman village. Bid a fond au revoir to the River Seine at a farewell reception and dinner onboard ship tonight. Tour ends: Paris. Disembark this morning in Paris. Transfers are included from the riverboat to Charles de Gaulle International Airport, and Gare du Nord and Gare du Lyon train stations; allow a minimum of three hours for your flight check-in.